I just couldn’t resist making a Christmas card with the YUMMY color challenge on Create with Connie and Mary Thursday Challenge this week. With the fun snowflakes from Snowflake Card Thinlet set and a greeting…well, you really can’t go wrong on making quick and easy cards. And really by now…that is really all the time you have let for cards…quick and easy. I hope you are all done with yours and wrapping up your holiday preparation! Silver Glimmer – two strips 1/4 x 4 3/4. Add to card base on a diagonal and trim to fit. Whisper White – 3 3/4 x 5. Round the bottom two corners. Stamp greeting using Versamark and embossing using Cherry Cobbler Embossing Powder. Add panel to card fron using dimensionals. Use large snowflake thinlit in Cherry Cobbler and 3 small ones in Silver Glimmer. Add to card front. Color some large Basic Rhinestones using darkest Cherry Cobbler Blendabilities and add to center of snowflakes. Add some additional medium Basic Rhinestones to finish off. This entry was posted in Blendabilities, Create with Connie and Mary and tagged Merry Everything. Bookmark the permalink. This is fantastic! I love those snowflakes! May have to remember this for next year’s Christmas cards! 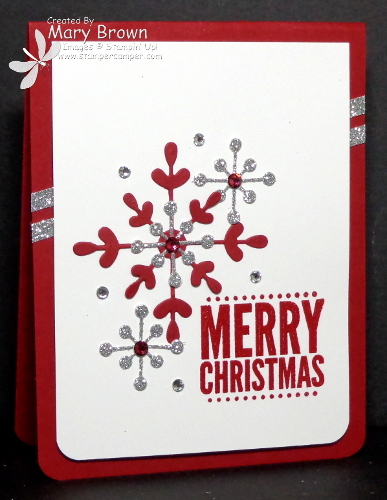 Love the red and silver snowflakes – I bet it really sparkles in person – especially with the added rhinestones! Wow! Gorgeous snowflake with red and glimmer paper! A beautiful crisp clean card!